Our living places should be as beautiful, smooth and calm as a forest glade. But how can we bring that green to our homes without occupying floor space? In high quality porcelain, Sky Planter promises to delight everyone and to take good care of your plants! With a simple and practical, dazzling design, your home will never be the same.... joyful, broad spaces!!!! 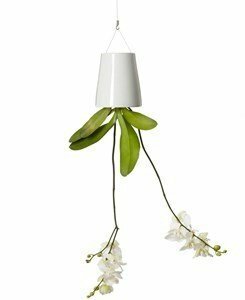 The hanging of the vases is very easy, just purchase one of the supports available here so that you can enjoy your hanging garden from the wall or from the ceiling. 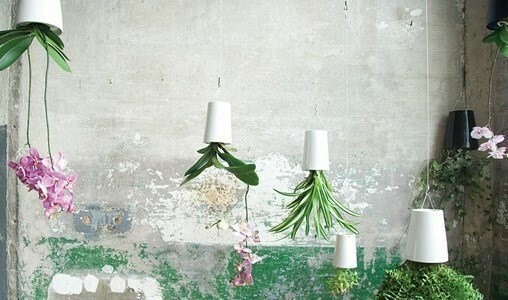 Watering the vases is also an easy chore, just fill in the upper reservoir with fresh water and hang it again. The reservoir is made of unglazed porcelain allowing the earth to absorve just the necessary water. Look up and enjoy nature's beauty in a BOSKKE sky! Join BOSKKE's gardening revolution and enjoy a heavenly forest at your home with SKY PLANTER. Made of ceramic, white or black. When you turn the front door, you must feel like you have just arrived at your dream house: your first home!